7.36 points at 14 votes (rank 242). A long time ago a demon named Warlord Gothar ruled over the Darklands. In the middle of this realm of the evil there was a peaceful kingdom, which was protected by a mystic skull, and where friendly creatures named Blizzies lived. But now Gothar has stolen this skull and not only that, but also the love of Jim Slim's life, the charming Candy, has been abducted and captured. So he sets off to free the skull and Candy from the clutch of Gothar and so save the kingdom from sinking into darkness. On his travel, Jim (who resembles a friendly ball, can roll and jump and collect items) will pass through dangerous woods and caves and defend himself against the backers of Gothar. 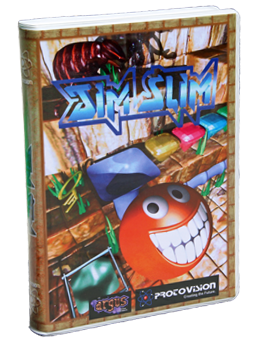 You need to solve 15 different levels with each 3 levels (so 45 levels altogether) before Jim Slim has finished his task. To successfully solve a level Jim "only" has to get from the starting field "GO" to the end field "OK". 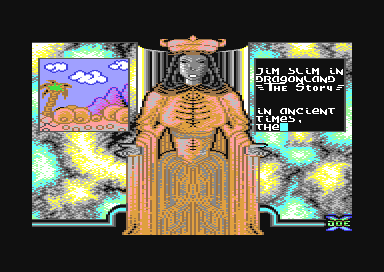 The background story is told in the intro at the start of the game (can be aborted with the space key). Each of the 15 worlds has its own monsters, very well-made background graphics scrolling into all directions and music, and after playing through it can be called up again by entering a password. The controls are easy to learn and direct. 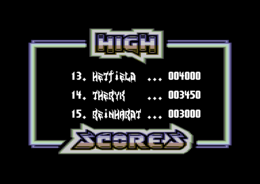 The highscore list containing 15 entries is saved on disk. The professionally designed box with nice cover contains the game disk, a manual in German and English and a protovision demo disk. 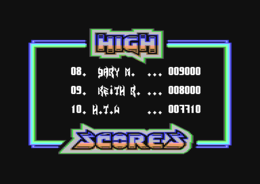 After the intro, you see the menu, the objects to collect, the credits and the highscore list in turns. Is Jim uses a trampolin he will jump one field higher per each jump. By pressing the joystick forward he jumps higher faster. As soon as Jim has a weapon he can use it for a limited time by pressing the fire button and moving the joystick into the desired shooting direction . Teleporter are marked by arrows up and down and transport Jim to another place in the level. Jim can enter tubes which then also transport him to a different place. This can also be dangerous. a field with three time bars, of which the first two are the time left for solving the level and the third is the time left for using a collected weapon. Extra time: The bar of the time countdown is set to maximum. Ninja star: Enables you to shoot as long as the third bar in the display is visible. Key: There are keys in different colours, which are required to open the corresponding doors. Objects as keys, extra lifes, extra time etc. and also the different enemies are always at the same place, therefore you should create maps of each level. In level 13 you might stand in front of the spikes (see image) rather helplessly and think about how to get through. But the path is different: You needs to jump over the star at the upper left of the spikes and then let yourself fall down through the permeable scaffold and right away pull the joystick to the right. Then be careful not to fall down to the starting point again but leave the shaft to the left. To get over the start, a "secret" ability of Jim Slim is needed. He can also jump 2 fields to the right, if he has no space left to jump up. For this you need to press the joystick up and then move it left or right at the right moment. This requires some practice and an exact joystick. Places where this "move" is needed can also be found in later levels (e.g. level 18). With a password you get to the beginning of one of the 15 worlds. H.T.W: "A very nice cuddly puzzle game with multicoloured softly scrolling graphics, great music and although the level size is not that big, you need a lot of skill an remembrance ability in the later levels, due to the level build-up, the extras, the skillfully placed enemies and the path connections as movable platforms, tubes and transmitters. There is a highscore list which is saved on disk, levels can be selected by a password, loading times are - depending on the medium - short or not at all there and the game supports 1541/70/71/81, FD2000/4000, CMD HD and REU (if you play over REU the highscore list is nevertheless saved on disk). Additionally the diskbox is designed with great attention to detail and the handling from order over shipping to the arrival at your home is trouble-free and fast. Again, a nice piece of software which is (in my opinion) more than worth its price, will occupy me for long hours and nights and which I can clearly recommend. My vote: very good!". Camailleon: "Very interesting version of a jump'n run, with very nice graphics and for me until now unique moves. The grinning of Jim after reaching the "OK" field is very cute. Sound effects fit very well. The difficulty grade is well-balanced, the motivation is kept alive and - I fully agree with H.T.W - one can spend hours with this game. The 45 levels still have some things to be revealed, I am anxious for nice backgrounds, enemies and puzzles. In any case I do not regret the purchase of this game. A small minus is, that one may have a C64 which does not support AGSP-scrolling. However: Very recommendable!" Video at YouTube Jim Slim - played through! This page was last modified on 3 October 2016, at 14:28.